New York Times bestselling author Janice Kaplan examines the phenomenon of luck--and discovers the exciting ways you can grab opportunities and make luck for yourself every day. After spending a year researching and experiencing gratitude for The Gratitude Diaries, Janice Kaplan is back to tackle another big, mysterious influence in all our lives: luck. And this time she's joined on her journey by coauthor Dr. Barnaby Marsh, a renowned academic who guides her exploration. 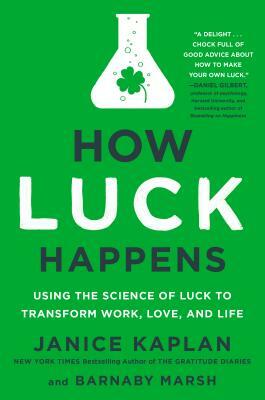 Together they uncover the unexpected, little-understood science behind what we call "luck," proving that many seemingly random events are actually under your--and everyone's--control. They examine the factors that made stars like Harrison Ford and Jonathan Groff so successful, and learn the real secrets that made Kate Spade and Warby Parker into global brands. Using original research, fascinating studies, and engaging interviews, Kaplan and Marsh reveal the simple techniques to create luck in love and marriage, business and career, and health, happiness, and family relationships. Their breakthrough insights prove that all of us--from CEOs to stay-at-home moms--can tip the scales of fortune in our favor. Through a mix of scientific research, conversations with famous and successful people--from academics like Dan Ariely and Leonard Mlodinow to actor Josh Groban--and powerful narrative, How Luck Happens uncovers a fascinating subject in accessible and entertaining style.